Venus, sometimes known as the "morning star" when it rises early in the morning, will be visible in the predawn sky in November. Say farewell to the ringed beauty Saturn: In November, it drops into the sunset fires, until it is out of sight. In fact, not a single bright planet is evident in the evening sky this month. Fear not: the planets reappear in the predawn sky. To entice you out of your warm bed are Venus, Jupiter and Mars, along with a lovely crescent moon early in the month. The planets gradually spread apart as November progresses. Remember that you can use your clenched fist at arm's length — equal to about 10 degrees of the night sky — to measure angular distances. The brightest stars are equal to first or zero magnitude, while the very brightest objects (Venus, the moon and the sun) are of negative magnitude. 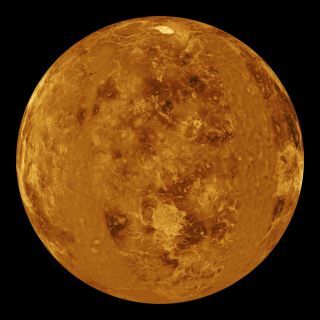 Today (Nov. 3), Venus is the dazzling "Morning Star," rising more than 3.5 hours before sunup all month (more than 2 hours before the first light of dawn). The planet's altitude a half hour before sunrise declines only a little for mid-northern viewers from about 37 degrees to 32 degrees over the course of the month. Venus was at its greatest elongation (47 degrees west of the sun) on Oct. 26, but its dichotomy or apparent half phase as seen in a telescope, is probably happening now. As November marches on, Venus becomes more gibbous while also shrinking in apparent size. Venus is receding into the distance ahead of Earth as it outraces us in its faster orbit around the sun. This morning, take note of the much dimmer (by a full six magnitudes) yellow-orange Marssitting just 0.7 degrees to the upper left of Venus. On Friday (Nov. 6), Jupiter rises around 1:50 a.m. local time. By the end of the month it will be coming up closer to 12:30 a.m. It's in Leo, a constellation most people associate with late winter and spring, which indeed is when Jupiter will be at its evening height. The best time for viewing the giant planet in November is just before dawn, around 5 a.m., when it will be shining brightly very high in the southeast. The giant glares at magnitude -1.9. This morning it will be strikingly paired with a wide crescent moon; Jupiter will be positioned 2.6 degrees to the moon's upper left. Binoculars or a small telescope will give fine views of Venus passing close to three fairly bright stars in Virgo during the first three weeks of this month. This morning at dawn Venus is 0.2 degrees north of Beta Virginis, magnitude +3.8. Nov. 7: Early this morning, just 24 hours after its rendezvous with Jupiter, a slightly thinner crescent moon pays Venus and Mars a visit. Dazzling Venus will be sitting just 1.6 degree to the upper left of the moon, while dim Mars can be found 2.2 degrees above the moon. Nov. 13: Early this morning, Venus passes only 9 arc minutes (0.15 degrees) north of Eta Virginis, magnitude +4.0. As seen from China, Venus and this star appear even closer, only 5 arc minutes apart. Nov. 17: Mercury passes through superior conjunction (beyond the sun) and into the evening sky today, but this planet remains too close to the sun to observe all of this month. Also, Venus is 1.1 degrees to the lower right of the close double star Gamma Virginis (Porrima) this morning. Nov. 29: About 4.2 degrees to the lower right of Venus this morning is the bluish first-magnitude star Spica, the brightest star in the zodiacal constellation of Virgo, the Maiden. Nov. 30: Saturn slipped into the bright evening twilight at midmonth and disappeared in the glare of the sun. Today it passes behind the sun, lost from view until later in December.